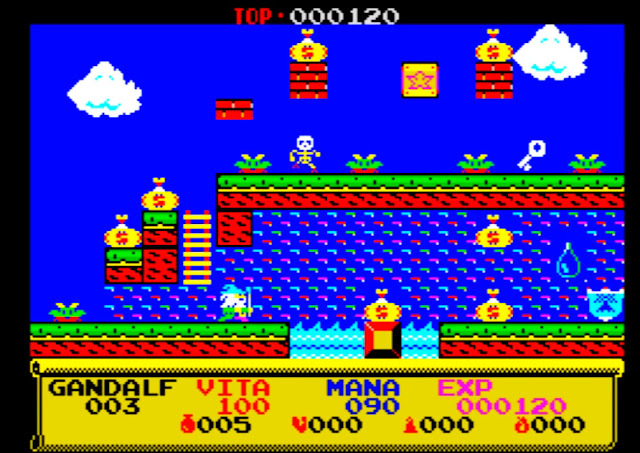 During the early part of this year we announced the release of a brilliant ZX Spectrum game called ' Gandalf ', which was finished for the ZX-Dev conversion competition as a multi-screen platformer based on the Gandalf character and developed using Nirvana+. Well there's great news for today, as we've recently been told by Gaming Legends that the same developer of Cgonzalez has released the Deluxe version with enhanced performance and in game music! You can read our big review of Gandalf linked below, but sufficed to say this is a game you will enjoy immensily. It has fantastic ZX Spectrum graphics, the level designs are sublime, the enemy animations are rather nice, and what's more the game will keep you hooked for weeks. So if you have a soft spot for Mario and had to watch Lord of the Rings more than once, then check out Gandalf Deluxe, you'll be pleased you did!